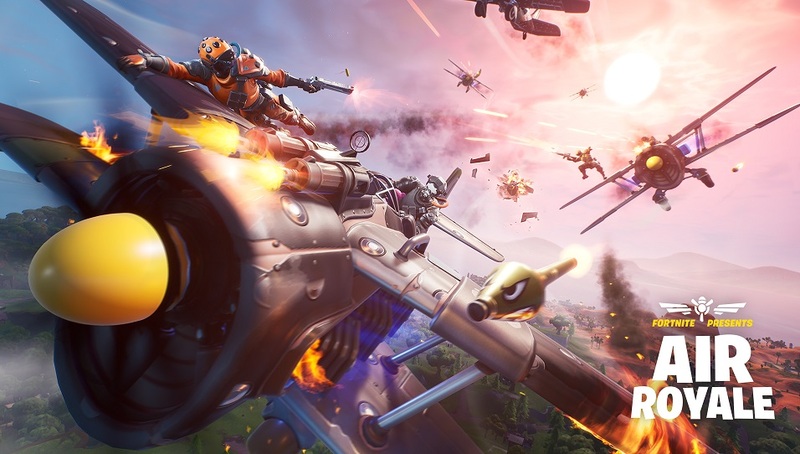 It’s not enough that Fortnite: Battle Royale is drawing inspiration from other battle royale games — now it’s taking a page out of War Thunder‘s and World of Warplanes‘ books, too. “Air Royale” is one of two limited-time game modes that arrive in today’s Update 8.40. It’s a duos-only mode that will see you take to the skies for as long as you can, shooting down your enemies while the storm gradually closes in from above. You can equip yourself with loot chests that fall from the sky, and each plane has three lives/respawns, but you can jack more from your enemies. Another limited-time mode included in this update is “Food Fight – Deep Fried,” which tasks two teams with protecting their fast-food mascot from enemy assault. When it’s destroyed, teams lose the ability to respawn, making it … well, like a normal battle royale. But with a giant animal head! Also just in time for Easter is the Egg Launcher skin for the grenade launcher, larger XP bonuses from the Battle Pass when you group with friends, and you can now pet the dog — which is almost certainly another case of Epic Games copying something from another game that’s recently been in the news. At least they’re consistent. Learn more about this update on the Fortnite site.